Becoming Vegan is perfect for both the new vegan and the experienced alike. 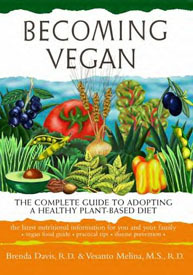 Filled with information on plant-based nutrition including the health benefits of a vegan diet, getting your necessary protein, eating during pregnancy, athletic performance, weight gain/loss, and so much more, you'll find that this is the most comprehensive book on the vegan diet that exists. 281 pages. Cover price is $29.95, our price is $24.99! From shay of san diego, California on 3/9/2006 . this is the book i have been waiting for. very informative, and easy to understand. highly motivating as well. its an amazing book. From Shanna of Sacramento, California on 7/27/2004 . This book is the perfect book for those just starting into veganism and for old pros who what to reorient themselves. It is very well written and full of example menus and excellent nutritional information. The book's authors are quite good a debunking vegan myths.